Computed tomography is a noninvasive technique for reconstructing an object from projection data. If the object consists of only a few materials, discrete tomography allows us to use prior knowledge of the gray values corresponding to these materials to improve the accuracy of the reconstruction. The Discrete Algebraic Reconstruction Technique (DART) is a reconstruction algorithm for discrete tomography. DART can result in accurate reconstructions, computed by iteratively refining the boundary of the object. However, this boundary update is not robust against noise and DART does not work well when confronted with high noise levels. In this paper we propose a modified DART algorithm, which imposes a set of soft constraints on the pixel values. The soft constraints allow noise to be spread across the whole image domain, proportional to these constraints, rather than across boundaries. The results of our numerical experiments show that SDART yields more accurate reconstructions, compared to DART, if the signal-to-noise ratio is low. Bleichrodt, F, Tabak, F, & Batenburg, K.J. (2014). 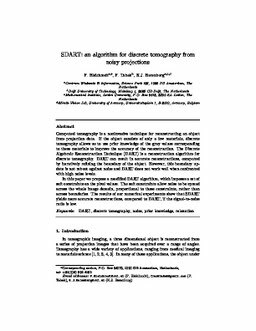 SDART: An algorithm for discrete tomography from noisy projections. Computer Vision and Image Understanding, 129, 63–74.